Vienna, the capital of Austria, is arguably one of the grandest capitals in Europe. I’ve visited this beautiful city five times over the years and have gotten to know it fairly well. My most recent visit was during a river cruise from Budapest (Hungary) to Nuremberg (Germany) with Viking Cruises. The ship stopped in Vienna for a full day and I took my partner, who’d not been there in a long time, out on a walking tour of Vienna to show my take on the city; from its historic grandeur to its vibrant, trendy side. We started our walk at the Karlsplatz U-Bahn station. Along the way, we passed Vienna’s main highlights such as the Museum Quarter, Hofburg and St. Stephens Cathedral, and ended at one of my favourite parts of Vienna: the Danube Canal. Our Vienna walking tour covered a distance of approximately 12km and we did it comfortably within a day. We started our walking tour of Vienna at the Karlsplatz U-Bahn (metro) station and continued to our first stop, the Opera House. Originally called the Vienna Court Opera, this magnificent building has a history dating back to the mid-19th century. If you have the time, sign up for a tour inside (or even better, buy a ticket for a performance) as it really is stunning! From here, we strolled down the Opera Ring road (Opernring) and entered the Burggarten (Burg Gardens). 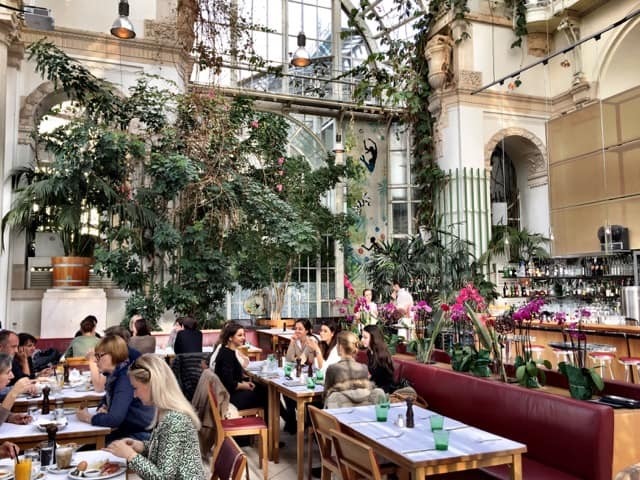 Inside this compound is one of my favourite Viennese cafés, the Palmenhaus. We stopped here for an ‘Einspänner’ (a Viennese coffee comprised of two shots of espresso and whipped cream) before continuing to the Museum Quarter. The Palmenhaus in the Burggarten. An Einspänner at the Palmenhaus. 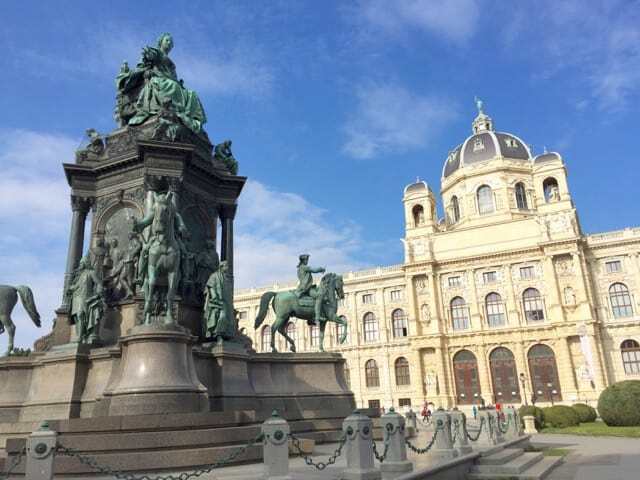 Our first stop was the Maria-Theresienplatz (Maria Theresa Square), with its grand statues in the middle and the Art History and Natural History museums on either side. We then walked further to the striking Mumok (Museum of Contemporary Art) before turning back to the Ring road. We followed the Ring road, passing the Parliament Building, until our next stop: the Rathaus (City Hall). With its beautiful spires, the Rathaus is one of my favourite historic buildings in Vienna. 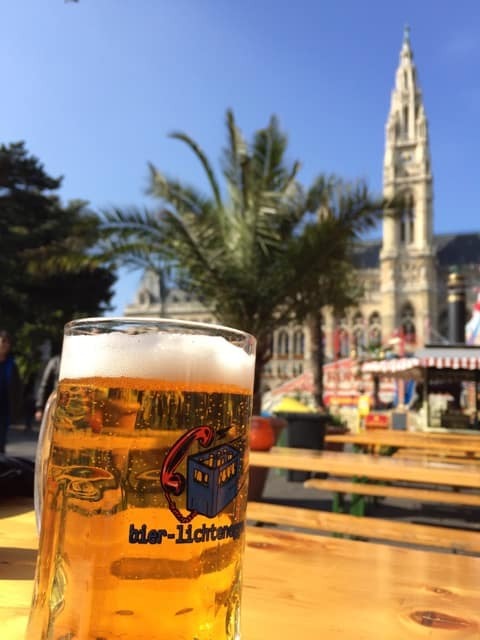 The square in front of the Rathaus was filled with food stalls, benches and tables that day so we grabbed the opportunity to have a local beer and a bratwurst! There were other stalls selling Viennese wines (Vienna is the only capital city in the world with vineyards within its boundaries!) and food but we chose to move on. 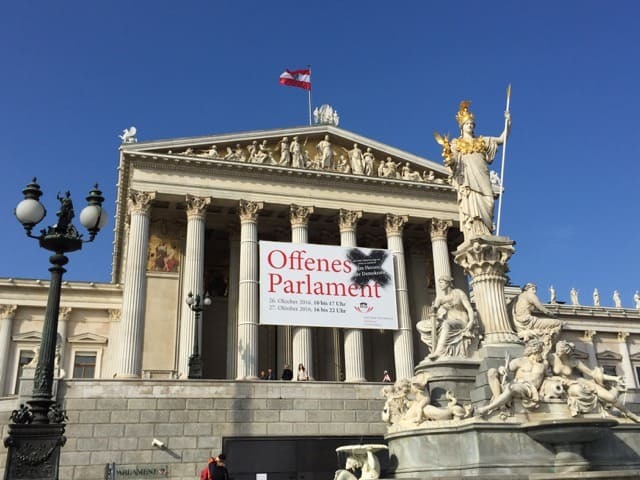 The Parliament building in Vienna. Enjoying a beer at the Rathaus. 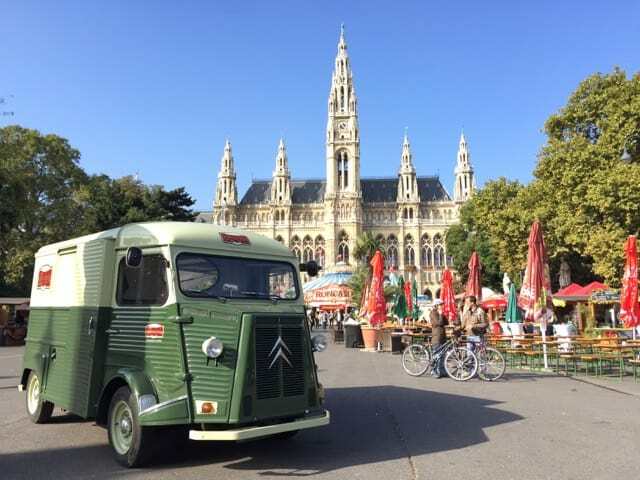 From the Rathaus, we crossed the Ring road and headed towards the historic centre, passing the Burgtheater and another iconic Vienna café: Café Landtmann. 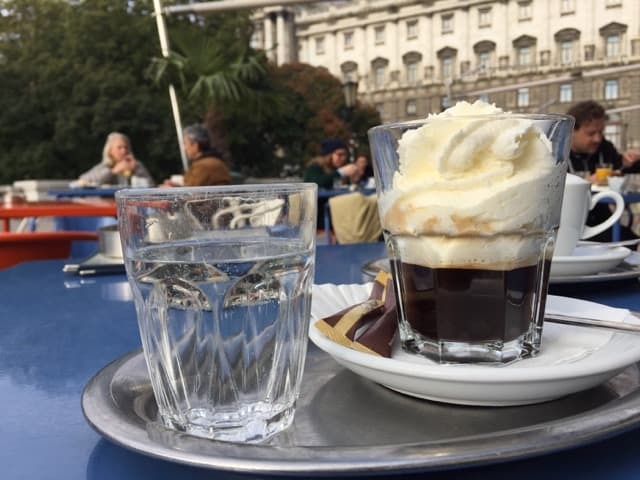 Vienna’s love affair with coffee and cafés dates back to the 17th century when the Ottomans were driven back from the gates of Vienna. This failed attempt by the Ottomans to occupy Vienna was a turning point in European history. As the Ottomans retreated, they left behind their bags of coffee beans. This marked the start of the Viennese coffee culture, which was later reinforced by the opening of coffee houses around the city. 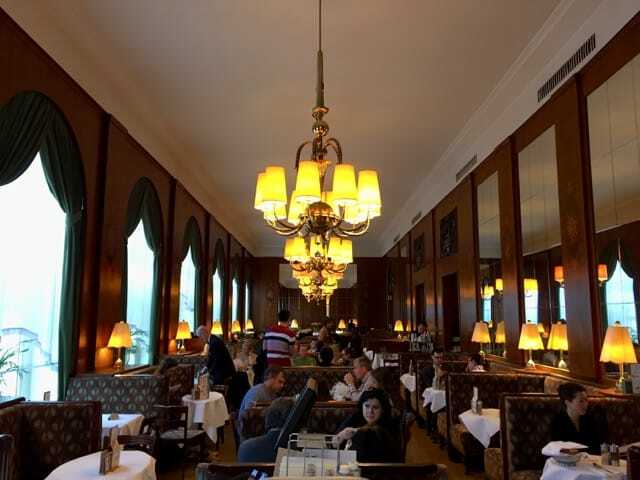 These coffee houses soon came up with their own blends and types of coffee (the Wiener Melange is perhaps the most famous), and cakes (such as the Sacher Torte). We continued our walk towards the Hofburg, passing yet another historic café along the way: Café Central. The Hofburg, one of the grandest buildings in Vienna, is the former Imperial Palace. Built from the 13th century onwards, the Hofburg now houses the office of the President of Austria. 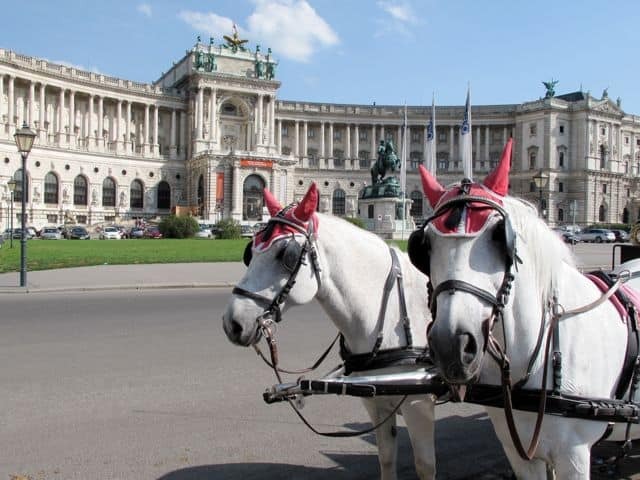 Next door, you’ll find another famous Vienna attraction: the Spanish Riding School. 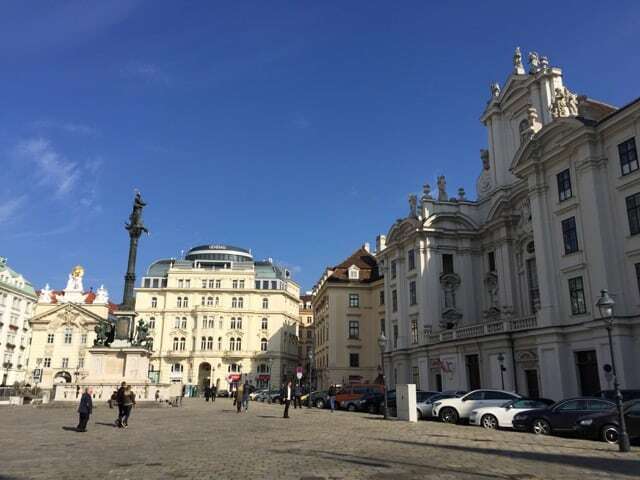 From here, we criss-crossed various shopping streets like the Graben, passed the lovely Am Hof square and had a peek inside the beautiful St. Peter’s Church before arriving in the heart of Vienna: Stephansplatz (Stephans Square), with its imposing St. Stephens Cathedral (Stephansdom). 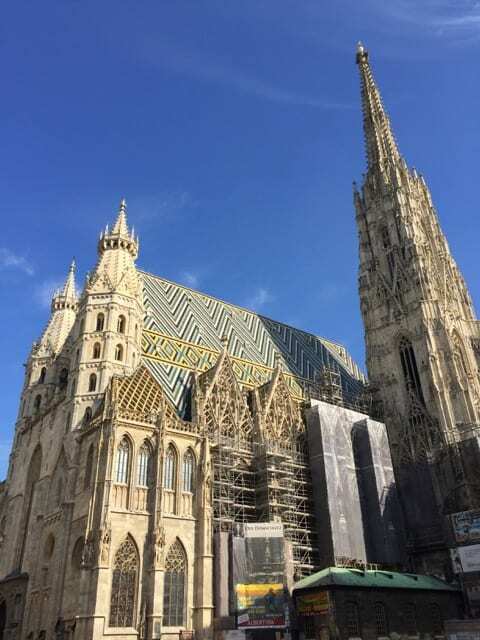 Built in the 14th century, the Stephansdom is a beautiful mix of Gothic and Romanesque architecture and is a must-visit for any first-time visitor to Vienna. St. Stephens Cathedral or Stephansdom. We left the Stephansdom behind us and continued in a zig-zag pattern through the narrow streets and galleries in the historic centre, passing countless shops, cafés, restaurants and art galleries. We stopped for a minute at Figlmüller Wollzeile, a restaurant famous for its classic schnitzels, but decided to move on as I had dinner plans elsewhere! From here, we made our way to the old Jewish Quarter (around St. Rupert’s Church and the Stadttempel) before reaching the Danube Canal. The Danube Canal (or ‘Donaukanal’ in German) is an arm of the Danube River, Europe’s second-longest river, and runs alongside the historic city centre of Vienna. Originally a natural offshoot of the Danube River, the canal was regulated and turned into a water channel in the 17th century. These days, the canal is a popular recreation area for the locals. 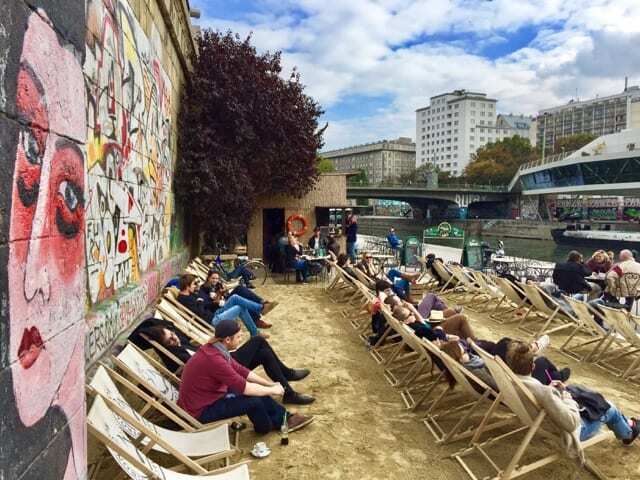 With its colourful street art, cool cafés and restaurants, and urban beaches, the Danube Canal is one of my favourite areas in Vienna. The Danube Canal. The building perched above the canal on the right houses the Motto am Fluss café/restaurant. We strolled along both sides of the canal, admiring the street art and watching the locals enjoy the sunny day. 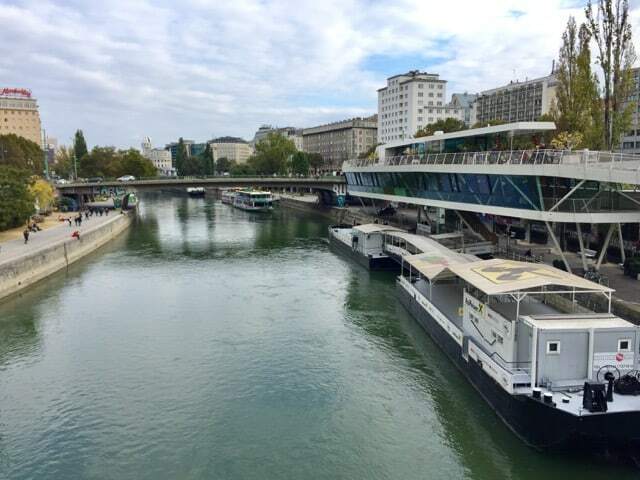 Though minutes away from the historic grandeur of Vienna, the Danube Canal, with its contemporary urban vibe, feels like a completely different world altogether! Street art along the Danube Canal. 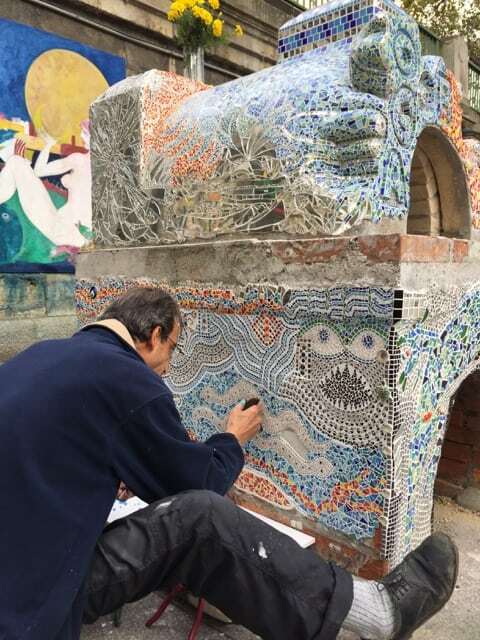 A mosaic artist at work along the Danube Canal. The Danube Canal is a popular place for the locals to relax, especially on a sunny day. Our stroll ended with a well-deserved wine and dinner at the wonderful Motto am Fluss café/restaurant perched above the banks of the Danube Canal. I can definitely recommend this restaurant for its excellent service and food! 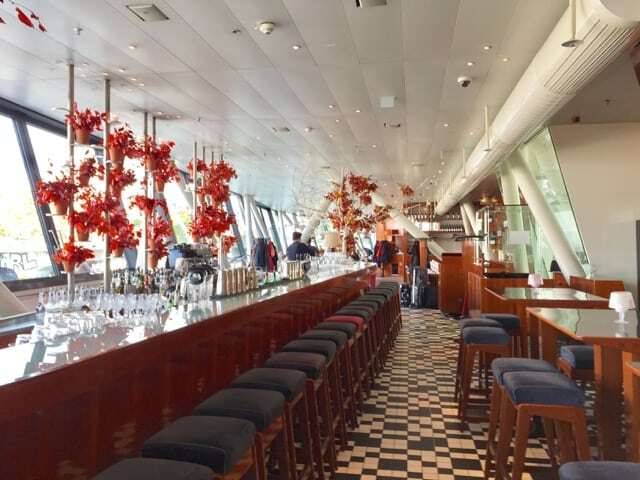 Motto am Fluss is a great place to eat, drink and chill. I had one more treat for my partner. After dinner, we crossed the Danube Canal and headed for the Sofitel Vienna Stephansdom. 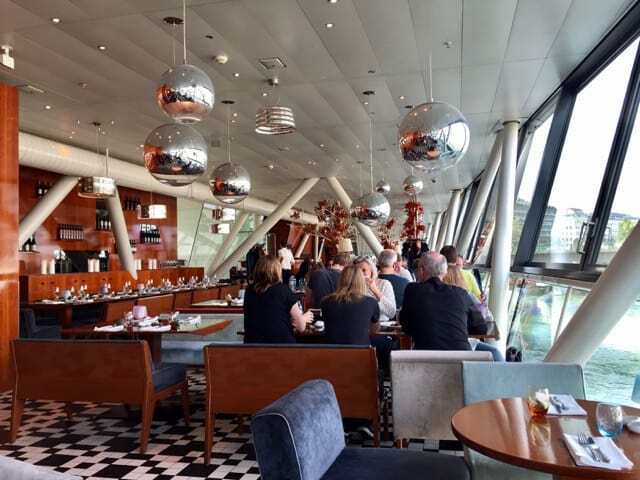 We entered the hotel and took the lift to The Loft (Das Loft), a restaurant and bar with some of the finest views of Vienna (another bar I can recommend with panoramic views of Vienna is the SKY bar located above the Steffl department store in the city centre). The Loft features floor-to-ceiling windows, a striking ceiling, and above all, spectacular views across Vienna. As we sipped on a delicious Grüner Veltliner, we gazed at the city lights and pointed at the landmarks we’d passed earlier in the day. It was a fabulous end to a terrific day in Vienna! 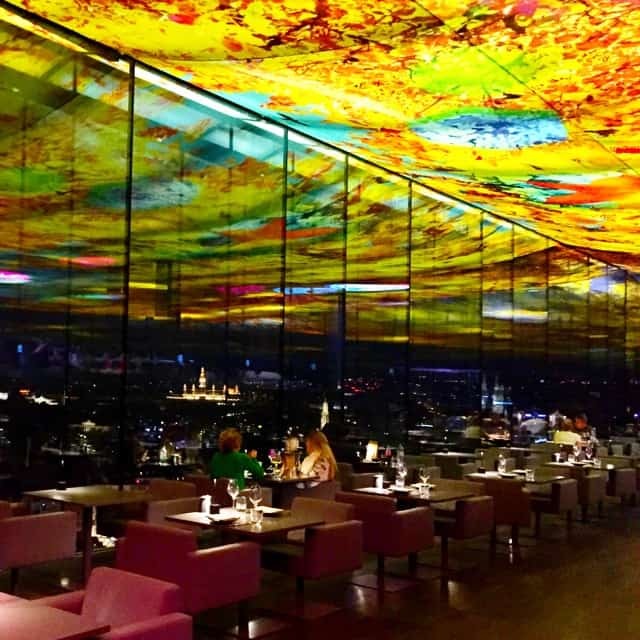 A colourful ceiling and panoramic views from Das Loft in the Sofitel Vienna Stephansdom. If you’re visiting Vienna, I highly recommend spending at least 3-4 days there to enjoy the city and its famous attractions. 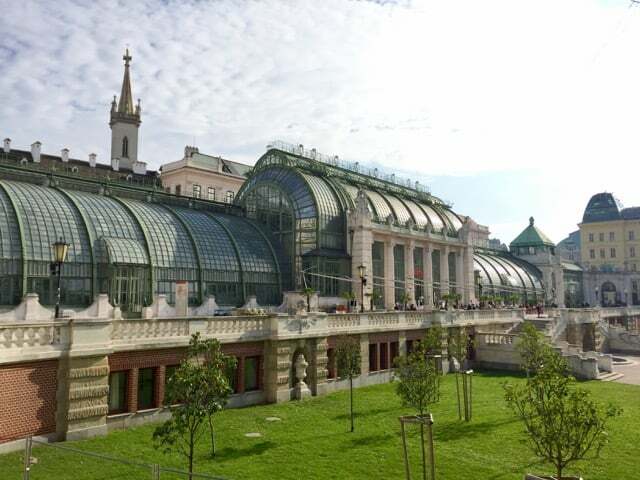 Visit the stunning palaces such as the Belvedere or Schönbrunn, attend a philharmonic concert or opera, go wine-tasting in one of the many ‘heurige’ (wine taverns) in one of the Viennese wine villages such as Nussdorf, Neustift or Stammersdorf, or go shopping in the trendy 6th and 7th districts. Thanks for your lovely comment. I totally agree with you: Vienna needs much more attention than one day! This post is for those who only have a day (because they’re on a day trip from another city or they’re on a cruise, like I was). I hope this post helps them to get a great feel for the diversity of Vienna during their short stay. I think that Vienna needs much more attention than one day. However, your story is very inspirational Keith! Thanks a bunch for your efforts to share this story. Thank you for your comment. Do you mean a day-trip from Vienna? It’s possible to do that but you’ll be travelling most of the day (to and fro) and will have very little time to see any of those cities in a day, which would be a pity because there’s so much to see and do. I suggest spending at least 3 days in Budapest and/or Prague, and at least a night in Salzburg. Wow, such a nice blog. I will definitely follow thai’s walk when I am there in September. Would you recommend a day trip to either Budapest, Prague or Salzburg via Viator ? Prague and Vienna are very different cities – I think Prague has a more medieval feel. I’m sure you’ll enjoy Vienna! It is very nice and inspiring blog! I am going to go to Vienna for first time next spring and for sure I will take a walking tour according to your advices. It is fun, I have been in a lot of cities of the world but never in Vienna. It is because I live in Prague and many people say that Prague is a similar city like Vienna. So I am curious if it is true. Thanks Brittany for your comment! I’m sure you’ll love Vienna! What a fabulous looking city … will definitely slot in during my European tour next year!